Jergens Inc. announces its Quick Loc™ (QL) pallet system for fixturing solutions on horizontal, vertical, and rotary operations. These low-profile adapters and pallets ensure repeatability of 0.0003” and provide clamping forces of nearly 14,000 pounds A single drive screw is used for fast operation. Manufactured from case-hardened steel for high rigidity, QL is available in multiple styles including square, rectangle, round receivers, and cubes in both 52mm and 96mm patterns. 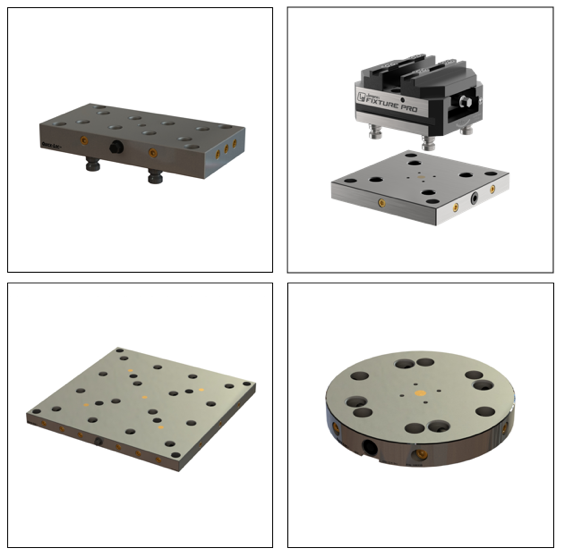 The comprehensive selection of base, pallet, riser, and accessories makes this system configurable for an almost unlimited range of applications. The QL pallet system, in combination with Jergens’ top tooling choices such as the new compact 130mm self-centering vise, are an industry first choice for increased machining access and quick change-over.